Shy Cora, newcomer Violet and assertive Jordyn are friends—or possibly frenemies—in a rural Iowa middle school in Before She Was Found. Cora and Violet are forced by their teacher to add “mean girl” Jordyn to their group researching urban legends for a class project. Jordyn suggests using Joseph Wither, a local murderer from the 1940s who has since gained urban legend status. When the girls have a sleepover, they decide to go to the deserted train yard to look for evidence that Joseph is real. The next morning, one girl is found severely wounded. One is in shock and covered with blood. The last denies she was even at the train station. All state they don’t recall what happened. I enjoyed the different reactions of the parents and guardians of the girls. One hides what may or may not be evidence. Another gets angry at the other girls, the doctors and the police. There are many twists and turns as each girl begins to point their finger at another. The innovation of using case notes, police interview transcripts, personal journals and multiple point-of-views works to allow the reader to see everyone’s side. The final conclusion was intended to be a big surprise but I saw the foreshadowing and guessed the end. 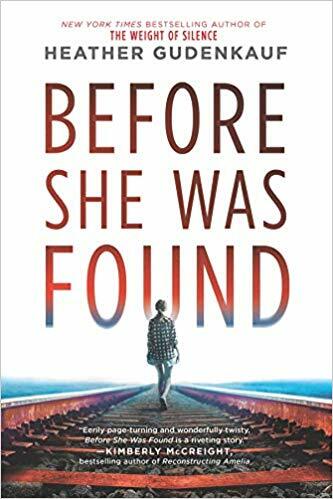 Before She Was Found is highly recommended for thriller fans. 4 stars! Thanks to Park Row Books and NetGalley for a copy in exchange for my honest review.